Cracks caused by the contraction of sulfate are evident in this image of the surface of Mars' Meridiani Planum site by NASA's Opportunity Rover. Liquid water on Mars may have once drizzled from the skyor collected as dew on the ground. The falling water left signs in the Martian soil measuredby NASA?s Viking, Pathfinder, and rover missions, a new study suggests. "By analyzing the chemistry of the planet's soil, wecan derive important information about Mars' climate history," said RonaldAmundson, UC Berkeley ecologist and the study's lead author. It was already known that it snowsaround the north pole of Mars. And there is ample evidence that liquidwater used to well up from beneath the surface, as hot springs or groundwater. But water falling from the Martian sky is somethingthat's never been proven. The frigid climate on Mars has locked the planet?s waterin ice, but scientists agree that a warmer climate 4.6 billion to 3.5 billionyears ago allowed for liquid water in lakes and rivers. Now the new studysuggests that liquid water still existed in the Martian atmosphere even more recently,from 3.5 billion to 1.8 billion years ago. The study will be detailed online in Geochimica etCosmochimica Acta this month and in a print issue in August. Amundson?s team saw evidence that the Martian soil hadlost much of the elements in the original rock fragments which formed the soil.That pattern suggests water once moved downward through the dirt and washedthose elements away. 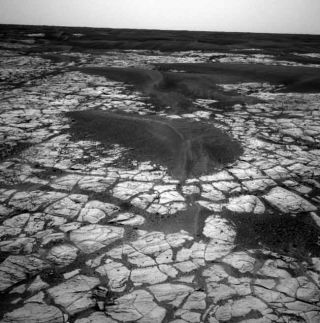 The Mars record also shows a long period of drying out,as seen in surface patterns in the sulfate-rich soil. The researchers comparedthat to very similar patterns in Chile?s Atacama Desert, the driest region onEarth with just 1 millimeter of annual rainfall on average. "The Atacama Desert and the dry valleys of Antarcticaare where Earth meets Mars," Amundson said. "I would argue that Marshas more in common geochemically with these climate extremes on Earth thanthese sites have in common with the rest of our planet." Sulfates appear to have accumulated on the surface with layers of chloride saltbeneath — a pattern suggesting water fell onto the soil from the Martianatmosphere. Because sulfates are less soluble in water than chloride, they tendto separate out from water first. That means water moving downward would carrychlorides further beyond the sulfates. Scientists still debate how much Earth?s climate cancompare to that of Mars, but Amundson argues that the Martian soil stands as a?museum? containing the history of water on the planet. Looking to Earth mayhelp unlock that record. "It seems very logical that a dry, arid planet likeMars with the same bedrock geology as many places on Earth would have some ofthe same hydrological and geological processes operating that occur in ourdeserts here on Earth," Amundson said.